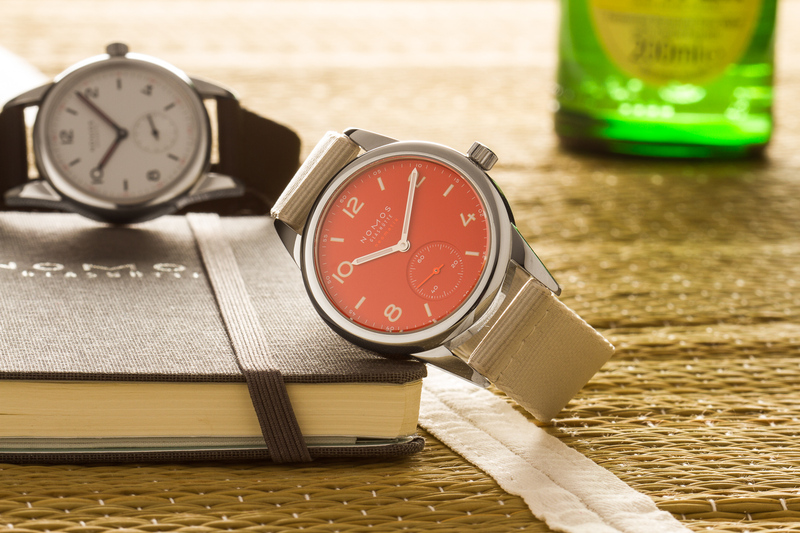 What watch would you choose if NOMOS offered to lend you one, carte blanche? My #1 choice was the Club Neomatik Signalrot, introduced at BaselWorld 2017, and one of the latest, greatest and most colorful Club models yet. My favorite NOMOS is the Club. More specifically it’s the Club 701, which is one of their most affordable watches. I’ve worn mine almost non-stop ever since I acquired it, and I am not about to stop. In fact I love it so much that I would seriously entertain the idea of adding another Club to the stable. So, when NOMOS asked me which watch I’d like to wear for a Minimatikal review, I instantly knew the first one had to be the Club Neomatik Signalrot – a self-winding Club with a powerful red dial. How would this funky upper class Club compare to my simple 701, and would that funky red dial feel after a few days? The Club Neomatik was introduced at BaselWorld 2017. It features a stainless steel case of 37mm excluding crown, which is rated water resistant up to 20 atmosphere of pressure. It is fitted with sapphire crystal glasses on both front and back, the latter allowing for a view of the in-house, self-winding caliber DUW 3001. I measured the lug to lug to be about 47.2mm, and it takes 18mm straps. The Club Neomatik is not the most expensive Club model – that’d be the Automatic Date. However considering it is powered by NOMOS’ latest and thinnest self-winding movement, it is arguably the most high-end model of the range in terms of specifications. Finally, at the moment of writing it is available with a choice of four dials; silver, dark blue or ‘Atlantik’, light blue or ‘Signalblau’, and finally red or ‘Signalrot’. When I first took the Club Signalrot out of its packaging and strapped it on, it instantly felt at home. Of course the dimensions are very similar to my Club 701; 37 versus 36 mm diameter, 48.4 versus 47.2 mm lug-to-lug, and finally 9.2mm versus 8.1 mm in height. They’re all rather modest increases. I found the difference in height to the most noticeable – which is probably partly caused by the different shape and feel of the sapphire crystal back compared to the stainless steel one found on my own. The finish of the case seems to be one or two notches above the simpler Club – or is it just difference in price that’s playing tricks with my mind? The transition between the case body and the lugs seems more articulate on the Neomatik , with sharper separations between the two on both the side as well as on the top. The difference in movements is mainly a matter of taste. I’m a fan of the simple Alpha movement and I enjoy the ritual of winding it. However, the DUW3001 ‘Neomatik’ is a beautiful movement and a perfect representation of the direction NOMOS’ is heading in. It does come at a price though; when both have a sapphire crystal back the difference is almost 100%, and it’s even greater when compared to my 701. So, let’s talk about the dial. In German it’s called Signalrot, but surprisingly it isn’t quite the RAL color of the same name. Also, in real life it appears a bit lighter than it does on the NOMOS stock images, and the grain is not as obvious. It is a warm and vibrant red. According to NOMOS it should remind you of corals and rubber boats. I was mainly thinking summer and sunsets on the beach though – and longing for those every time I looked at it! The Club is a pretty playful watch to start with and this color really takes it to the next level. At the same time the subtle dimensions of the watch prevent it from being overly loud. As this was a loaner I didn’t play around with straps but rather wore it on the grayish textile it was supplied with. It’s a good match that enhances the overall summer vibe. I imagine finding a better match would be quite a challenge, as of course the dial color does limited your options. It is a challenge I’d gladly take on though! I love this watch. It’s cheerful yet packs a serious horological punch, and it stands out without being overpowering. It wears much more easily than I expected, and it was every bit as much fun once the novelty wore off. It’s not for everyone, and I wouldn’t recommend it as a first watch – but it makes for a fun addition if you already own a NOMOS (or other watch) in a more traditional color. I’d love to add it to my own little stable, though not without thoroughly inspecting the Signalblau, which I adore too. Last but not least, I think it’d make sense for NOMOS to also offer at least one of these vibrant colors in the more accessibly priced Alpha-powered Clubs.